Awesome product, beautiful look with best camera quality. This phone has crystal clear display. Front camera is also good with LED flash. Exchanged with Galaxy J7 prime.. Awesome I love it n i m sure most of you all too love it.. And yes Compareraja for suggesting me best mobile at best features & best price. Its Bezel-free Design makes your experiences boundless. As the placement of the fingerprint sensor is at back it gives hassle-free unlocking experience. I had bought this model on Sep 2018. But it was tempered device and there's audio and sound issue. But over all it makes me bother. Latest price of Samsung Galaxy J8 (2018) in India was fetched online from Flipkart, Amazon, Snapdeal, Shopclues and Tata Cliq. 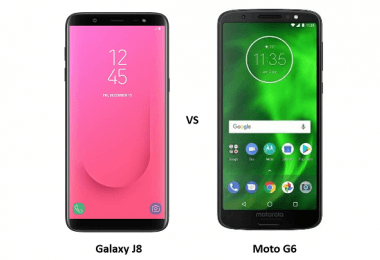 "Samsung Galaxy J8 vs Moto G6: Price, Features and Specifications Compared"
"Samsung Galaxy J8 Launched At Rs 18,990"
Samsung is a renowned electronics company with a commitment to cater to rich digital experiences via innovative technology. Samsung Galaxy J8 was launched earlier this year. In this model, the Korean company included new features like the chat- over- video for the convenience of multitaskers. This feature allows the user to open a translucent chat window while watching a video or video chatting. In addition to that, another new feature is Samsung’s Virtual Assistant, Bixby along with the Google Assistant. This phone boasts of features that are expected from a typical Samsung flagship phone, and it falls in the mid-range cost bracket. The smartphone is powered by an Octa-core, Qualcomm Snapdragon 450, and 1.8GHz processor speed. The phone is available in three colours: Blue, Black and Gold. A promising battery backup, the camera, especially the live focus feature and the impressive design together make the Samsung Galaxy J8 price worthy. The Galaxy J8 comes with a powerful dual camera. The primary rear camera is 16-megapixel with a f/1.7 aperture. The secondary camera is a 5-megapixel camera with a f/1.9 aperture. At the front, it has a 16-megapixel selfie camera with a f/1.9 aperture. Both the front and rear cameras have single-LED flashes. The camera comes with lots of clicking modes in its camera app such as Sports, Night, Live Focus, Panorama and Beauty. The Pro mode lets you control the ISO, white balance, exposure, and metering. There is only one variant of this phone, and it has a 4GB RAM and 64GB of internal storage. After considering the pre-installed apps, the storage capacity available to the user is about 51GB. The user can expand the storage up to 256GB with the support of a micro SD card. Galaxy J8 has a non-removable, 3500mAh, Li-ion battery. It comes with a 5V, Micro- USB fast charger. A fully charged battery lasts up to 23hrs talk time and up to 112 hours with music play. This model has multi-touch and a super AMOLED infinity display. The 6-inch display has an HD+ resolution with a 720*1480 pixel resolution. The pixel density of the handset is 274ppi. Galaxy J8 lacks an ambient light sensor and does not have an always on display. The 2.5D curved glass screen gives the mobile a seamless edge and makes it aesthetically more appealing. Galaxy J8 is dual sim handset and supports a NANO Sim card supporting 4G. Only one sim slot can be active for 4G usage, while the other supports 3G network. Other forms of connectivity offered include Bluetooth 4.2, .2, Wi-Fi 802.11 b/g/n, 4G, and VoLTE. 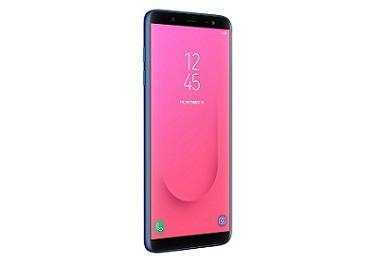 The device runs with Android 8.0 Oreo and Samsung Experience U, which brings along the many customization options for the user. The phone has pre-installed apps such as the Samsung Mall, which allows you to search for products on shopping websites using image recognition.